Morning has not come yet. Sun still hide in the shelter. But, Lorita has been woken up from her dream. She can’t sleep tight. In her mind, there’s only Reynald, her beloved. They promise to meet after one year not meet. Wish can change the time, she really wants to wake the sun and the capon. This also happen to Reynald at the same time, at different place. He felt what his lover felt. He suffers from his missing so deep. He can’t close his eyes and always imagine meet his beloved. Time has pass, leave all behind. The only thing left only history and old story. That morning, Oenesu still quite. Sunshine still can’t breakthrough the trees and leaves. There, a couple sweetheart meet and look the eyes each other. They are Lorita and Reynald. The rumble Oenesu became the witness, the happiness they united again. 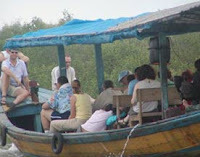 For them, Oenesu is not only a natural location for traveling. This place was their memory how they met as lovers. That was one of many stories that happen in Oenesu. Oenesu often visited by falling in love couple. Besides them, many local and foreign tourists (especially Australia) came this multilevel waterfall. Oenesu is the most crowded main tourist place in Kupang. At weekend or holiday, this place could be visited by more than 1,500 people. Oenesu has 0,7 Ha wide area. The topography is quite challenging, it’s hilly. 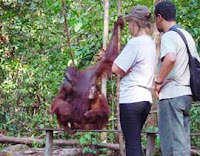 So, it’s suitable for you who love outbond activity such as cross the jungle or follow the river. There are wild animals and wild bird inside the jungle. When I came to Oenesu, I saw young men search shrimps by wood lance. 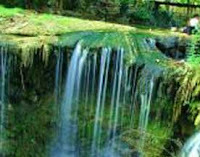 Oenesu is a special waterfall, it has four levels. The water fall from one level to the next level and there is a big nature pond in the middle of the waterfall that tease everybody to swim. When rainy season come, the water bulk and water volume is overwhelming, but the water still clear and pure. While when summer come, the water never dry only the volume decrease, not as many as rainy season, but the water getting more clear. 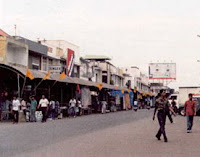 Now, Oenesu become the most favorite place to visit. 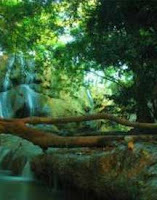 You can swim, take a bath, camp or traveling the jungle around the waterfall. Visitors can use the stairway to go the waterfall base easily. There is also wood bridge to go to the jungle. While, area surroundings the parking area, there are gazebos as rest place or to buy some food and beverage around it. Sun get more lay to the west, Oenesu start to abandoned by the visitors one by one. But nor for the Lorita and Reynold. They still comfortable sitting on the sandstone next to first level waterfall. They still enjoy their time together. 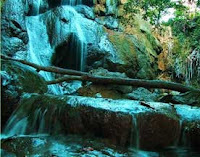 Oenesu waterfall was located at West Kupang regency, about 17 kilometers from Kupang city, East Nusa Tenggara. Access to this waterfall is very smooth, only couple kilometers at the waterfall gate the road a little bit broke. Oenesu can be reach by private or public transportation. If you use public transportation, you can rent a travel car from Kupang, it’s about Rp 500,000 / day and 1.5 trip from Kupang. The Ticket to enter this location is Rp 1,500 / adult and Rp 1,000 / child while the parking fee is Rp 2.000 for car and Rp 1,000 for motorcycle. 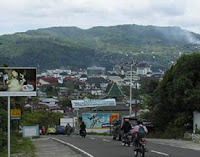 Ambon, after social riot several years ago, has been changed from dead city to beautiful city. Diverse and attractive tourism passed off for couple year, has been rework since 2008. 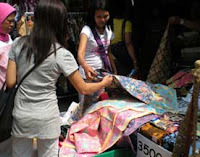 And the result, slowly, Ambon tourism began to show up again. Every weekend many tourists come to the tourist area around the city. 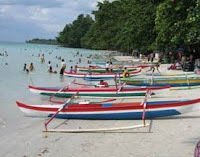 While for the foreign tourists which usually come from Dutch, also come to locations around the beach. 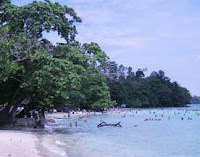 But, where is the location for tourists area in Ambon? 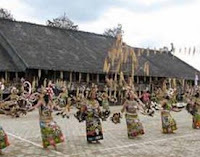 J Watratan, Head of Culture and Tourism Department of Maluku Province said each tourists area in Ambon is attractive and has its own special quality compared to tourists area in Java and Bali. 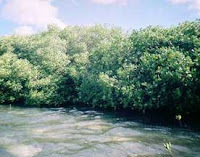 See Tanjung Marthafhons (Marthafhons Cape) and the City Gate, It has a very wonderful attractive power. 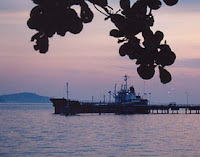 Tanjung Marthafons or Tanjung Martha Alfons, located across the Ambon city. 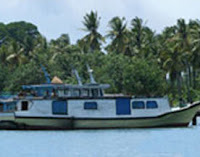 To reach that place, citizen can utilize ferry or dugout. Tanjung Marthafons has slope slightly beach, beautiful sand and completed with edge (border coast) made from wall, one meter height. At this wall, people can enjoy the calm cape coolly. 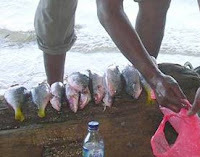 "That’s why every Sunday night or holiday Tanjung Marthafons never been quite from visitors," said Samuel Hehanusa, security guard of Tanjung Marthafons. 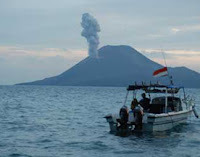 Samuel said that when Ambon still completely safe in Orde Baru periode (President Soeharto still in charge), Tanjung Marthafons region was governable by Pertamina (Government industry). 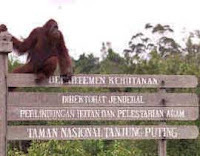 The land was owned by Pertamina. Not wonder if this location often used by Pertamina’s managers as asylum. There are night show, karaoke, and place for dancing, all available here. But in Social crisis area, several years ago, all entertainment facilities including asylum and villas have been burnt. Now, we can only see the debris which still exists. 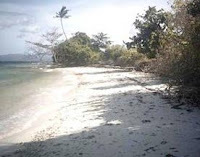 The beach atmosphere still gorgeous, "We sell the atmosphere to all the tourists so that at weekend and holiday this area never been quite from visitors," said Samuel. Ambon Tourist Department also established this location as traditional dugout competition. Other activity which held routinely is garbage diving in the cape. 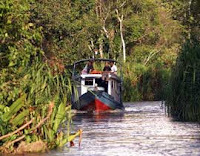 "Last year, when the traditional dugout held lots of local tourists come to this location. Maybe because many artists from Ambon follow that show", said Samuel again. Then what is the attract power of the city gate? J Watratan told the story, for ordinary people consider the city gate as a “gate” to enter the city. Actually, city gate is a tourist location. When you arrive to the city gate you can see a square hole at the hillside. 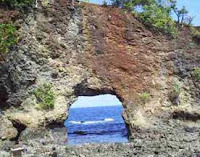 If the whether is bright, visitors can see the Ambon’s atmosphere at night from the hole. What a beautiful scenery, city view, full of light. You also can see many boats and ships come and go. The mystic Baduy people, the beautiful white sand coast. 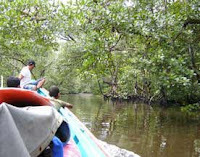 the lush Ujung Kulon jungle, the supernatural attraction, here is Banten. Creeps!! 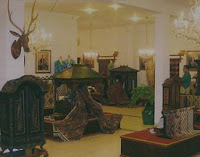 That was your first impression when you saw Debus attraction, unique and rare attraction only available in Banten. 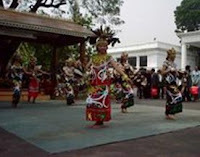 Debus is combination of Pencak Silat (martial art) and traditional music with strong magic. If you see debus, you’re like see Superman who invulnerable to sharp weapon and not burn fried in fire. 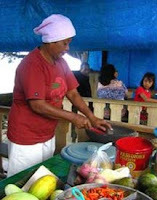 Not wonder if this special Banten tradition not only popular in Indonesia, but also popular in world wide. 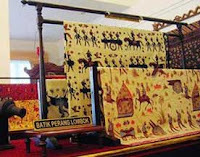 The magic and religic thing in debus has already start since 16 century, when Banten lead by Sultan Maulana Hasanuddin. 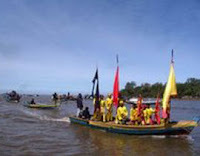 Debus used as device for Ulamas to spread Islam at Banten and around it. This quite reasonable, because the character of Banten people still hard till now. When Dutch come to Banten, debus present the firing the spirit of Banten warriors against colonizer. Now, debus shows up with different face. This attraction was packed nicely, so many tourists can show the attraction. A moment before the show, Usually players do some special ritual to prepare their self with fasting and praying so that they’ll gave safety at the show, minimal 2 days before the show. Generally, all players have pencak silat skill. But, it doesn’t mean all pencak silat players can play debus. They must have some special skills to do debus. Debus starts with gembung (opening) when all players read shalawat (prayers) to Nabi Muhammad and dzikir with percussion musical chairs. Half hour later, those prayers getting louder and intercommunicate each other. This stage called beluk. Together with beluk, all players start to attract; stab stomach with spear, chop hand with machete, glut fire, stab tongue or cheek skin with wire without bleeding (even if bleeding can be heal with one hand stroke!). Yes, it seems so horrible! But, this was the attract power. 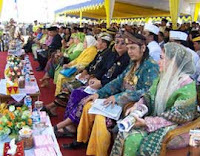 For researches and anthropologist, Budaya Baduy Village which located at Kanekes village, Leuwi Damar regency, Lebak, become a big magnet. Their life are still traditional and unique, very interesting to observe and study. 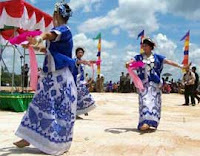 Because of them, now Kanekes village become famous and many local and foreign tourists come to see them. 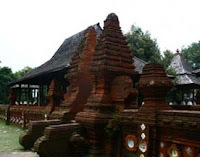 To go to Budaya Baduy village, you have to go to Rangkas Bitung. 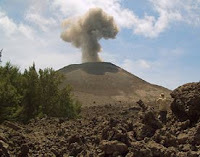 Then, continue your journey to Ciboleger, 38 kilometers from Rangkas Bitung. 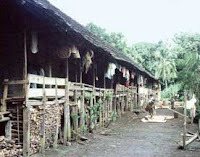 Actually, there are other ways to enter the Baduy area, but local government has already make Ciboleger as main gate. The road is nice, but still in several location is quite abrupt and landslide. So be careful! Before on to the Baduy area, all tourists have to report their company and ask permission to the chairman of the village. Then, you can start your journey again. There are two options to cross Baduy area. If you have lots of times or more than one day, you can cross to Cibeo, Cikertawana or Cikeusik, also known as Baduy Dalam (deep Baduy). It’s about 12 kilometer from Ciboleger and traveling by walk. 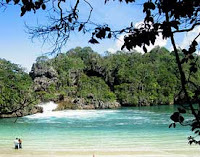 While for you who don’t have lots of time, Gajeboh which located 3.5 kilometer or 2 hours trip from Ciboleger, can be your option. 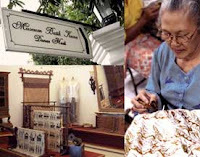 For you who visit this place for the first time, Guide will be very useful. You can find the guide at Ciboleger station and if you bring to much stuff and difficult for traveling, you can pay for a porter. The thing you must watch before enter Baduy region, there are several rules you must obey. One of the rule is : only Malayan (dark skin and dark eyes) can enter Baduy Dalam. While caucasian (Eropean) or Chinese people can not enter it. 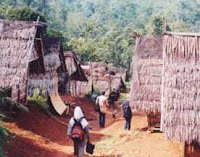 They only permissible enter the Baduy luar (beyond Baduy) or until Gajeboh village. As long as the tour, you’ll pass pathway in middle of the jungle and Baduy village, better if you wear sneakers or trekking. 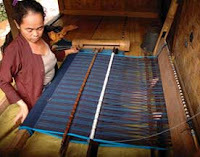 During the journey, you can see Baduy women woven fabric, men go back home while carry fruit from farm or children playing in front of their houses. At Baduy Luar area, you still can take a picture, except one, a ccustom house not far bridge made of bamboo at Gajeboh village. While at Baduy dalam you can’t take a picture at all. You must obey this rule!